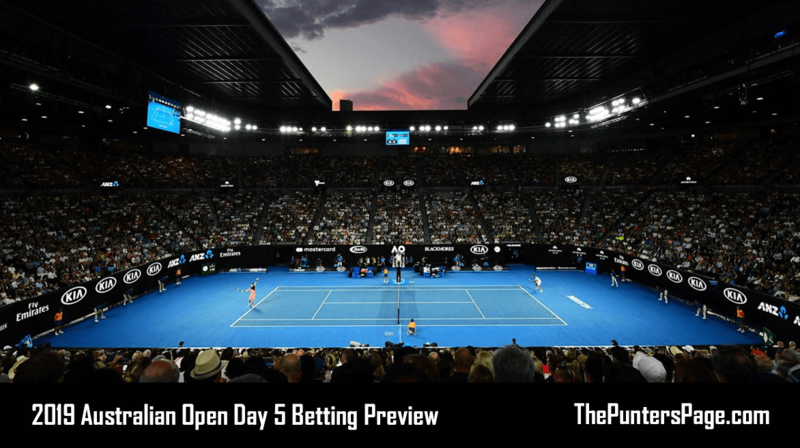 Friday marks day five at the 2019 Australian Open as we edge closer to the second week with the start of third round action. We returned to winning ways yesterday as Pierre Hugues-Herbert scored us a 13/10 winner with his four-set victory over Hyeon Chung. However, Evgeny Donskoy squandered a set point to level the match with Filip Krajinovic in the second set tie-break, eventually succumbing to a straight sets loss. Moving on, however, and the third round promises not to disappoint with a mouthwatering clash between Rafael Nadal and the 19-year-old Australian Alex De Minaur to commence the night session on Rod Laver Arena. Roger Federer faces a burgeoning Taylor Fritz earlier in the day, while last year’s finalist Marin Cilic meets Fernando Verdasco. It’s the latter clash which looks promising from a betting perspective, with Cilic 3-0 representing value at 5/4. The Croatian is beginning to build momentum having arrived in Melbourne without any competitive matches under his belt. He was broken only once in his straight sets win over Bernard Tomic in the first round and, bar a shaky third set against Mackenzie McDonald, played with solidity behind his serve. The problem will be the Croatian’s nerve if a tie-break does occur – which is likely – considering he squandered five set points against the American in the last round in the second set tie-break. He would have very likely have gotten the job done in straight sets were it not for his serve jitters at the crucial moments. Cilic leads their head-to-head 9-5 and has won their last four meetings on outdoor hard, with their most recent clash on the surface coming at the Japan Open in 2016. The Croatian is 9-2 in Melbourne over the last few years and, having answered early questions over his fitness, should prove too strong for Verdasco. Value, meanwhile, also lies in Nikoloz Basilashvili in his clash with Stefanos Tsitsipas on Margaret Court Arena at around 12:10AM GMT. The Georgian’s improvement over the last twelve months has been remarkable, with coach Jan De Witt finally able to fuse Basilashvili’s terrific ball-striking ability with a mental fortitude. His destruction of Juan Martin del Potro in the Beijing final last year was testament to that. Tsitsipas will step onto the court buoyed by a strong Greek contingent in the stands and he has required their backing during some hairy moments this week. The 20-year-old dropped the opening set in his first round match before winning only two games in the second set of his clash with Viktor Troicki on Wednesday, and as such it will be intriguing to see whether he can recover from a drop in level against an opponent with more pedigree. Basilashvili did require five sets against Italian qualifier Stefano Travaglia after trailing two sets to one, but it was not an overly physical match – perhaps mentally draining – so there shouldn’t be any concern that the Georgian will not be able to last the distance. Basilashvili +4.5 games is available at 10/11, but there is definite value in backing the 26-year-old to win at 12/5. Bookmakers are struggling to separate Frances Tiafoe and Andreas Seppi in their clash at around 1:30AM GMT, and it will be curious to see whether the former can build on his shock win over Kevin Anderson (our quarter winner outright). Seppi’s record in Australia is excellent and he has breezed through his opening two matches for the loss of only a set. The Italian is available at 10/11 to seal his place in the fourth round in Melbourne for the fifth time in his career.